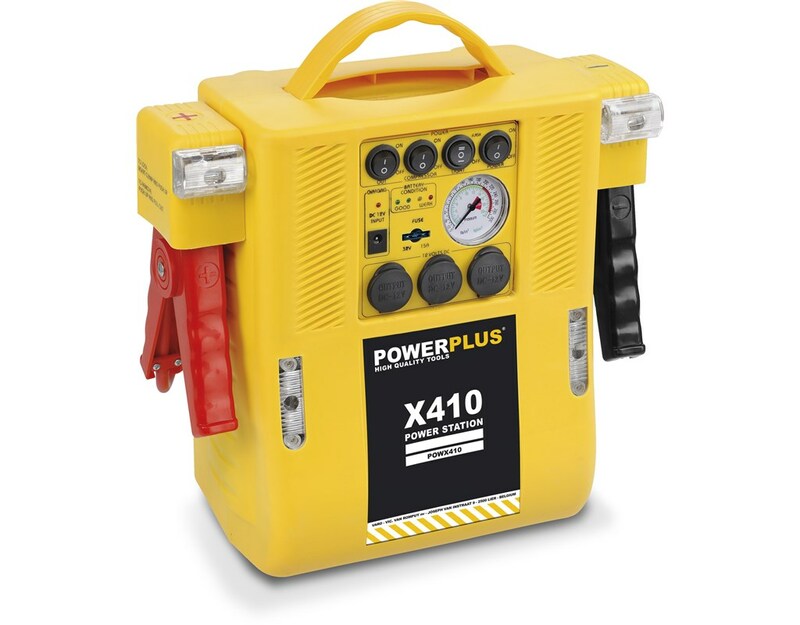 POWERPLUS POWER STATION WITH COMPRESSOR 4-IN-1 POWX410: Portable and handy power station for DC users. Thanks to its DC voltage output, this machine is highly suitable as power supply for radio, TV, laptop, mobile phone etc. In addition, it is suitable as start-up help for cars and motors with starting problems. The compressor integrated on the back side gives 17 bar. Ideal for inflating a ball, air bed, bicycle and car tyres etc. The impact-resistant plastic case with handle contains two 3-Watt work lights and two 3-Watt emergency lamps. Powerplus Heavy Duty Car Van Battery Charger Jump Starter and Air Compressor Inflation kit with Worklights – POWER PACK START VEHICLES WITH FLAT BATTERIES!